Holds can be placed by staff in the Staff Client and by patrons in the OPAC. Evergreen has five different levels of holds. Library staff can place holds at all five levels, while patrons can only place meta-record, title-level holds, and parts-level holds. The chart below summarizes the five levels of holds. Click on place hold next to the title. From holds confirmation screen, click Advanced hold options and select other applicable formats. Staff or patron click on place hold next to title. Staff or patron selects part on the create/edit hold screen when setting holds notification options. Holdings with identical parts attached to a single MARC (title) record. Staff click place hold on any items shown in holdings list, next to the call number. Holdings with identical call numbers owned by the same library and attached to a single MARC (title) record. Staff click details to view barcode then place hold next to that barcode. period in their library settings. Uncaptured holds will not be targeted after the expiration date. beside the title on the search results list, or click the Place Hold link on the title summary screen. attached. Those copies are usually the complete set, containing all the parts. 6. A confirmation screen appears with the message "Hold was successfully placed". Search for the meta-record on which you want to place a hold. 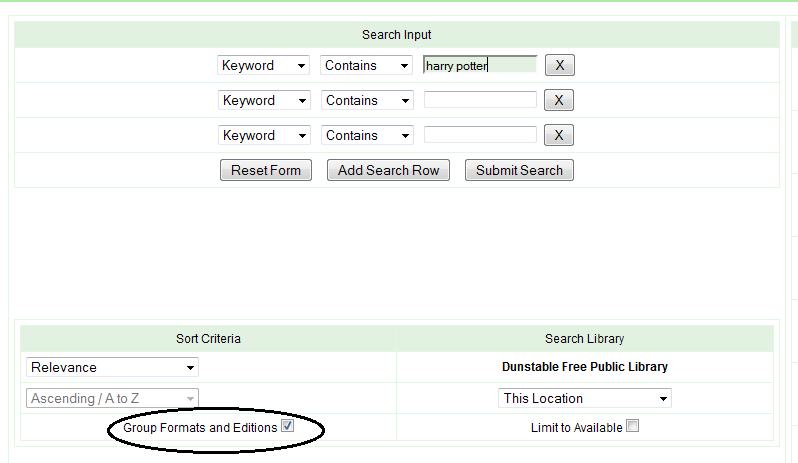 Select the Group by Formats and Editions checkbox from the advanced search screen. Enter search terms. Click Go. Click Place Hold beside the meta-record on the result list. The lit-up icons indicate the system-wide available formats. Click the title to find out the available formats and holdings information at your library. Type in or scan the patron barcode at the prompt. Select the acceptable formats. Use the CTRL key together with a mouse click to select multiple entries. Click Place Hold once done. If you do not select group formats and editions when conducting a search, you can still place a hold on a meta-record. After entering the user’s barcode, click Advanced Hold Options at the bottom of the screen to select acceptable formats for the hold. After a meta-record hold is placed, if a new MARC record is added and it meets the grouping criteria (title, author and format), items under this new record will be used to fulfill the existing holds. Requested formats are listed in the Holdable Formats column in hold records. Use the Column Picker to display it when the hold record is displayed. Format information is from the MARC record leader. To place a parts level, retrieve a record with parts-level items attached to the title, such as a multi-disc DVD, an annual travel guide, or a multi-volume book set. Place the hold as you would for a title-level hold. Scan or type patron’s barcode into Enter recipient barcode then click Submit. Select the applicable part from the Parts dropdown menu. Click Place Hold once done. Requested formats are listed in the Holdable Part column in hold records. Use the Column Picker to display it when the hold record is displayed. Parts level holds cannot be placed on meta-records. To place a volume level hold, only possible within the Staff Client, retrieve and display the record. Choose the appropriate volume record (call number). If not displayed, click View copy Information for all libraries to display all volumes. Click Place Hold under Actions for the appropriate volume record. Your hold will be on any copy with the same call number and the same owning library. Edit patron hold notification fields as required and click Place Hold. Note the hold is identified as a Volume Hold. To place a copy level hold, repeat steps 1 and 2 in the section called Volume Level Hold. Click on Copy details under Actions. Click place hold beside the barcode. Your hold will be on this specific copy. Edit the patron hold notification fields as required and click Place Hold. Note the hold is identified as a Copy Hold. Once you have physically located the material on the pull list on your shelves, you will next capture the hold within Evergreen. A. Select Circulation from menu bar → Capture Holds. B. Scan or type barcode and click Submit. C. A hold slip is automatically printed. If your workstation is not setup for silent printing (via Hatch), then a print window will appear. D. If the item should be sent to another location, a hold transit slip will be printed. If your workstation is not setup for silent printing (via Hatch), then a print window will appear. Select Circulation from menu bar → Capture Holds. 3. A hold slip is automatically printed. 4. If the item should be sent to another location, a hold transit slip will be printed. There are five status types a hold may have: Waiting for Copy, Waiting for Capture, In Transit, Reserved/Pending and Ready for Pickup. 1) Waiting for copy: all hold-able copies are checked out or not available. 2) Waiting for capture: an available copy is assigned to the hold. The item shows up on the Holds Pull List waiting for staff to capture the hold. 3) In Transit: hold is captured at a non-pickup branch and is on the way to the pick-up location. the status will automatically change to Ready for Pickup after a period of time – For example, CCPL has chosen 5 minutes as the time-frame to allow staff to place the item on the Holds Shelf. 5) Ready for pickup: Item is on the hold shelf ready for pickup; this status will also display in patron’s record online. Holds can be cancelled at any time by staff or patrons. Before holds are captured, staff or patrons can suspend them or set them as inactive for a period of time without losing the hold queue position, activate suspended holds, change notification method, phone number, pick-up location (for multi-branch libraries only), expiration date, activation date for inactive holds, etc. Once a hold is captured, staff can change the pickup location and extend the hold shelf time if required. Staff can edit holds in either patron’s records or the title records. Patrons can edit their holds in their account on the OPAC. If you use the column picker to change the holds display from one area of the staff client (e.g. the patron record), it will change the display for all parts of the staff client that deal with holds, including the title record holds display, the holds shelf display, and the pull list display. Retrieve the patron record and go to the Holds screen. Highlight the hold record, then select Actions. 3. Manage the hold by choosing an action on the list. a. If you want to cancel the hold, click Cancel Hold from the menu. You are prompted to select a reason and put in a note if required. To finish, click Apply. A captured hold with a status of On Hold Shelf can be cancelled by either staff or patrons. But the status of the item will not change until staff check it in. b. If you want to suspend a hold or activate a suspended hold, click the appropriate action on the list. You will be prompted to confirm your action. Suspended holds have a No value in the Active? column. widget to choose a date, then click Apply. Use the Clear button to unset the date. be prompted to enter the new date. Use the calendar widget to choose a date, then click Apply. can be different from the one in the patron account. It has no impact on the patron account. or disable email notification for the hold, check Send Emails on the prompt screen. libraries and choose the new pickup location. Click Submit. Desired Copy Quality on the Actions list. Make your choice in the pop-up window. 1. Holds on one title can be transferred to another with the hold request time preserved. To do so, you need to find the destination title and click Mark for: → Title Hold Transfer. 2. Select the hold you want to transfer. Click Actions → Transfer to Marked Title. Cancelled holds can be displayed. Click the Recently Cancelled Holds button on the Holds screen. 2. You can un-cancel holds. Based on your library’s setting, hold request time can be reset when a hold is un-cancelled. does not automatically recognize the newly added items as available to fill holds. View the holds for the item. Highlight all the holds for the record, which have a status of Waiting for Copy. If there are a lot of holds, it may be helpful to sort the holds by Status. Click on the head of the status column. Under Actions, select Find Another Target. A window will open asking if you are sure you would like to reset the holds for these items. Click Yes. Nothing may appear to happen, or if you are retargeting a lot of holds at once, your screen may go blank or seem to freeze for a moment while the holds are retargeted. When the screen refreshes, the holds will be retargeted. The system will now recognize the new items as available for holds. In NC Cardinal, each library system has a “hub” library, usually the main branch of that particular system. The hub handles all material to be sent out to other library systems’ hubs and any material coming to its own library system. Within multiple branch library systems, resource sharing is already prevalent amongst the branches, so a courier service of some sort is present. This courier service will still be used within each system and material being requested from a consortium branch library will be sent to the hub for shipping. Time differs with each system as to when courier services are used during the week (some systems have courier runs on Mondays and Thursdays while others have it Monday, Wednesday, and Thursday). The hub of a library system will also usually house the contact person who is in charge of shipping/ receiving consortium materials. The contact person works with the mail service NC Cardinal uses for its handling of material. At this time, we are under contract with UPS. Each library system should have a backup in case the contact person is not present for a long period of time. Each hub should have a space that is designated to accommodate for the shipping/receiving of consortium materials. Some hubs have a room that is used to process these materials while other systems may not have a large space to perform these daily tasks. It will be left up to the hub to decide on how this is arranged. Shelving can be a great way of storing the day’s pull list items or even separation of library system’s requests. If possible, a table of sorts can work nicely as a base for a scale, packaging tape, and other materials. A computer with a printer should be nearby to create your package labels. UPS is our consortium shipping service at this present time. Each time a staff member is shipping material to another system within the consortium, they will need to go to the UPS CampusShip website, located at www.campusship.ups.com. The contact person may allow other staff members access to the login and password, which is fine as long as the contact person is responsible for any issues that occur. A recommendation: whatever computer you use for your shipping of materials, you can save the information for future logins. Your library’s UPS account is strictly for resource sharing shipping in NC Cardinal only. This is where the address book is located and you should select where the shipment is going. Once you select a hub, then the pertinent information of that hub is populated. Note: Some libraries have more than three or four branches. Example: Asheville has 13 different branches. It is recommended that you set up only the library system hub information since it will be where material is directly sent or received. Section 2: “Where is this shipment coming from?” This will populate itself once you log into the system. This is done by setting up your information with the State Library and UPS. Packaging Type. You must choose “Other Packaging” and then input the packages weight. The service should always say UPS Ground Service. Then, you can check the boxes asking for “Send E-mail Notifications” and “Receive confirmation of delivery”. This is not a mandatory guideline but will help with tracking packages that you send to other consortia members. The contact person would then receive both of these emails. Then scroll down towards the bottom of the screen and click “next” again on the second page displayed. On the 3rd page, scroll down and click “Ship Now”. Lastly, a box should pop up asking where to print. Make sure that your printer is set up to correspond with the computer you are using to print your labels. Select Print. Once you have completed these steps, you can view a Tracking Number of the package along with a Guaranteed Delivery date, discounted charges for shipping, and the account of the shipper or library system. Take the printed label, fold in half with the UPS barcode and pertinent library system hub information front facing, place in one of the clear label UPS sleeves that you have ordered from UPS, and place on your package. Seal the sleeve closed for mailing. Once you have finished this process, your material can be placed wherever your daily UPS/mail delivery will be picked up or dropped off. Remember, whenever you reuse any box that your system has acquired for shipping that old labels be covered up, marked through, or taken off the box so that UPS does not think the box is either being sent right back to your system or to go to someone else that isn’t a part of our consortium. If you ever need to reprint a packaging slip or need to cancel a shipment before it has been sent out, you will need to look up the Tracking number of the package. Shipping tab > “View History” within the legend on the left side to view shipping history. To reprint labels > click “Reprint Label” for which label you need reprinted. Labels can be reprinted for the first 24 hours after creating a shipment. To void a shipment, click on the box to the left of the shipment and then “Void”. To share an address book, first export a current file and use that file to import into another account. The Manage My Settings screen will open. Under My UPS Address Book, click on Export Addresses. The View Import/Export Status screen will open. Click on the View data link under Status. The data file will be created as a Zip file. A pop-up message box will display to ask what you want to do with the file. Choose Open to open the zip folder to see the file. Save the CSEXPORT.CSV file to a local folder. Do not make any changes to the data. It is formatted to UPS specifications. Under My UPS Address Book, click on Import Addresses. View Import/Export Status screen will open. The Search My UPS Address Book screen will open. The screen will have a Search box at the top. all current addresses will be displayed at the bottom of the screen. the csexport.csv files are attached as downloads. 1) It is best to have at least two people who understand what your library’s daily resource sharing procedures entail. You never know when your contact person will be sick for a long period of time or on vacation. This way, your backup will know how to get into your UPS account to make labels. Regardless, there must be one person who is the contact. The contact person should also be located at the library system’s hub, if at all possible. 2) Keep track of your packages arriving to their destinations by checking the UPS box, “Send E-Mail Notifications “and “Receive Confirmation of Delivery” on the first page of the shipping interface. This way, you will be sent an email of what has arrived. 3) Use the address forum within UPS to keep your contacts up to date. Also, you will need to incorporate the hub library into the receiving address field for shipping. 4) You may want to print off a list of all the library system’s branches, the hubs, and holds policies each system has which are found on The Nest via the State Library website. These are found within the Manuals tab. There are guides, how-to’s, library member listings, etc. The Nest is updated constantly. 5) Designate a single place or Library Hub for UPS for your packages to be dropped off / picked up. Library systems tend to have their own internal courier service/system. 6) Use the pull list for all of your branches for your own internal pulls. 7) Reuse any packing material that you can. Boxes work the best. 8) Even though messages or alerts may pop up once an item is checked in, make sure that you still look to see what the message or alert tells you. Check to see if all DVDs are housed in their case or any multi-media is attached to a book. 9) If there is an issue with an item that comes to your location, you can always contact the owning library’s resource sharing contact for information or help. Printing off the contact list is helpful in that sense. 10) If a damaged item or an item missing pieces is sent to your system, be mindful of all the ways you can deal with the item. You can send the material back to its owning library with a note while retargeting the hold for another library. You can place notes in your system describing the issue with the material while allowing your patron to check out the material. If something is missing (DVD has 5 discs but missing 1), you may call the owning library’s contact to see about locating the missing disc. You can also use the template in the back of this manual (on page 33, created by the Forsyth County Public Library resource sharing department and also located on the Nest) to attach notes to items. Please do not use scotch tape or masking tape on material as that can damage covers. 11) If an item appears to have gone missing during consortium-wide borrowing, you need to let the contact person of the owning library know so the copy status can be updated in the catalog. Any money that is given to replace a lost item stays in the county where it is received. It does not cross borders. 12) If a patron replaces a lost or damaged item with an exact copy, send that new item to the library system that had the original item. Most cases, the library that receives a replacement copy allows the patron to keep the damaged copy. 13) A transit slip must be printed out by the library filling the hold and/or by the library checking-in the item for return to the owning library. The transit slip should be placed inside the item if possible. Do not tape, paper clip or otherwise attach the transit receipt to the item. Inserting the transit slip into the item with the branch destination is best. 14) The circulating library’s circulation policies will apply to the item regardless of whether the patron is local or from another Cardinal library. When thinking of Intra-NC Cardinal lending, it is important to remember that an NC Cardinal patron is a patron exactly like your local patron. Intra-NC Cardinal Lending loans are not Interlibrary Loans (ILL) – they are simply circulations like any other. 15) Holds may be placed on most items in any NC Cardinal library. If a patron presents the on-hold item for checkout before it is retrieved for the requesting hold patron, the in-house patron with item in hand receives preference; a circulation supervisor will override the hold and check out the item to the in-house patron. The requesting hold patron will remain in line for the item. Patrons whose NC Cardinal cards are “blocked” or “barred” will not be allowed to place holds until their card privileges are restored. 16) Each library system within NC Cardinal can designate specific items types to be non-holdable. These non-holdable items can be defined as 1) never holdable or 2) non-holdable for a specific length of time, for example, six months. 17) Patrons may return any borrowed item to any member library for transit back to the owning library. 18) Consolidate items into as less packages as permitted. Don’t overweight your boxes (no more than 40 pounds a box) or cram a box to the point of bursting at the seams, but be mindful of how much stuff is placed into your shipping packages. At the same time, do not send one item at a time whenever possible. 19) An easy way to track material out by your system would be to use the Transit List located in Admin section up at the top right of the Evergreen home page. Choose Local Admin, then Transit List. Choose dates that you want to look up items sent out to other systems. 20) Use the Cardinal Listserv ( nc-cardinal-announce@lists.ncmail.net. ) for any questions you have or need consensus information about resource sharing. This Damaged Item Template should be used whenever items either arrive to the pickup library for check out or when returning to its owning library. Listed below are the current hold policy restrictions for patrons of NC Cardinal Libraries requesting materials from outside their library system. These restrictions do not reflect policies that affect a library’s “own” patrons. All libraries have 6-month age hold protection on newly-active items. All libraries have Reference material as non-holdable. Also available is a downloadable version of this document.